These very words might also be used to describe another literary form that emerged almost simultaneously: electronic literature, which offers us similarly discjunctive literary experiences that are not only facilitated by computers, but impossible to experience without them. The lyric essay and electronic literature—particularly the subfield of polylinear narrative, which I will focus on here—share and are defined by a commitment to associational thinking and the accretion by fragments that Tall and D’Agata mention. Both assert that the narrative experience, like the human experience, is not neat and monolinear but polymorphous and predicated on disjunction. It is built on the combination of emotional stimuli in collision and congruence with each other, and the agency of readers plays an essential role in the creation of meaning. In this essay I would like to examine the shared territory between the lyric essay and the polylinear (also called multiform and multivariant) interactive narrative strain of electronic literature, specifically by exploring the process of developing my nonfiction work daddylabyrinth: a digital lyric memoir. The digital environment is ideal for the Modernist project of fragmenting human experience and seeing it in multiple combinations, and this multiplicity has been the clarion call of polylinear digital narrative since its earliest days. One of the first forms to emerge was hypertext fiction. The canonical works of that genre—Judy Malloy’s Uncle Roger (1986), Michael Joyce’s Afternoon (1987), Stuart Moulthrop’s Victory Garden (1992), and Shelley Jackson’s Patchwork Girl (1995)—most written on the StorySpace software platform developed by Eastgate Systems—all present the reader with multiple possible paths through their material. These works are spiritual descendants of Jorge Luis Borges’s story “The Garden of Forking Paths” which—with its “diverse futures, diverse times which themselves also proliferate and fork” (1962, 26)—figures in much critical and creative discussion of electronic literature. (Lev Manovich even named his contribution to The New Media Reader, Volume 1 (2003) as “New Media from Borges to HTML.”). Structurally they can also be said to resemble that non-hierarchal botanical structure we call the rhizome, which entered the digital literature conversation early via Gilles Deleuze and Félix Guittari. Their assertion that “any point of a rhizome can be connected to anything other, and must be” (1987, 7) became a veritable rallying cry for early proponents of hypertext and networked literary culture. The lyric essay and the multiform digital narrative stand on the same ever-shifting ground and ask their readers to do more work in the creation of meaning than their monolinear counterparts. But the digital work also asks for something more—the act of choosing which piece of the narrative to encounter next. This demands new forms of reading and writing, for which the lyric essay prepares us well. My own work increasingly resides at the intersection of the convergent evolutions of these forms, which is why I feel compelled to call attention to the nexus where they both meet. I stumbled onto this cusp because I could never write satisfactorily about my relationship with my father. When I was ten years old, he died while awaiting trial in Paterson, New Jersey for assault with intent to kill. For as long as I’ve been writing, I’ve tried to write about him and the absence his death left behind. Telling a monolinear story about the man and his role in my life always failed because I’d never had a coherent sense of him. In my imagination he was, and still is, a disparate mess of family legends, rumors, uncertain memories, and psychodramas extrapolated from photographs. I had only fragmented stories to tell, ways I’d been told I resembled him, pieces of his physical memory stored in boxes. Ideally I wanted to write a traditional father/son book, a bound and printed beginning-to-end meditation, but where could I begin it and end it? Chronology wouldn’t do, largely because I learned so many things about him out of sequence. The boxes of his things that my mother kept, for instance, were parceled out to me over the course of decades. My sense of the man I never truly knew became layered over time—each one an impression that I had grown in the petri dish of my imagination from a single bacterium—and my writing about him leaned toward the lyric essay instead of toward the traditional memoir I wanted to write. I knew a bit about his conflict with the roofers’ union, which eventually led to his crime. I know a bit about the time he served in prison as a younger man, his dishonorable discharge from the U.S. Army, and his boxing life. I had memories of his drunken singing, of going fossil hunting with him, of being petrified when he came home angry, of barely recognizing him during his last months when he sat around the house drugged out on what I now suspect was Thorazine. I wrote and wrote, but no book emerged. I could barely even squeeze out lyric essays for print, because all my stories were so very much in progress—open sores on the skin of my life that I could not allow to heal. I was deprived of using what Philip Lopate calls the “double perspective” (2005) to juxtapose my past experience with my present understanding and state of being. I could achieve nothing resembling this perspective because (1) I carried all my unresolved questions about my father around with me, disgorging their dramas wherever I went; (2) I became a father myself, which reopened every wound and question I had about fatherhood. My “dad issues” expanded from the piles of impressions I had formed about mine and into the pile of impressions my sons were forming about theirs before my eyes. This multiplied the small strands of story clustered around fatherhood in my imagination—all of them non-finite, still living, subject to continuous revision depending on how I felt about my father that day, how I felt about my sons, how they felt about me, and how I imagined my father would feel about us all. The dreamed-of book did not coalesce. Aristotelian monolinearity felt doomed because I couldn’t imagine where each vignette—in an ever-wriggling mass of them—might go if I were forced to put them in a line. Too many vignettes connected to too many others, and writing about being a father rather than simply having a father complicated my pool of stories. As my sons approached the age I was when I lost my father, my need to write about him became more urgent. The lyric essay continued to beckon. But with so many disjointed stories and no clear option beside the clumsy tool of chronology to connect them, the resulting book would be nothing but an exercise in sprawl. Then at a conference I saw a demonstration of a new software platform called Scalar, developed by the Alliance for Networking Visual Culture at the University of Southern California. 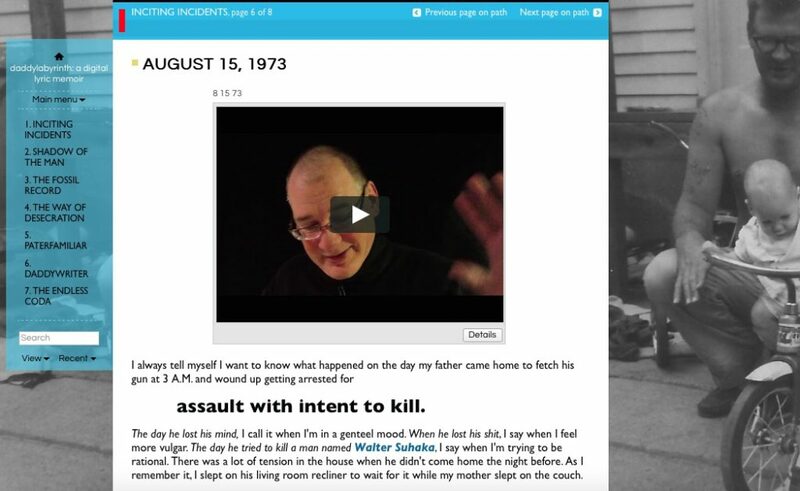 Originally created for media scholarship, and therefore endowed with robust tools for embedding web video, Scalar allows users to organize information in nested, interconnecting paths—perfect for my needs with the labyrinth of stories in my imagination that clustered around fatherhood. Before the twenty-minute demo was over I knew what I would write an expansive (and expandable) interactive, web-only book of lyric essays and videos about my life with my father and my life as a father. 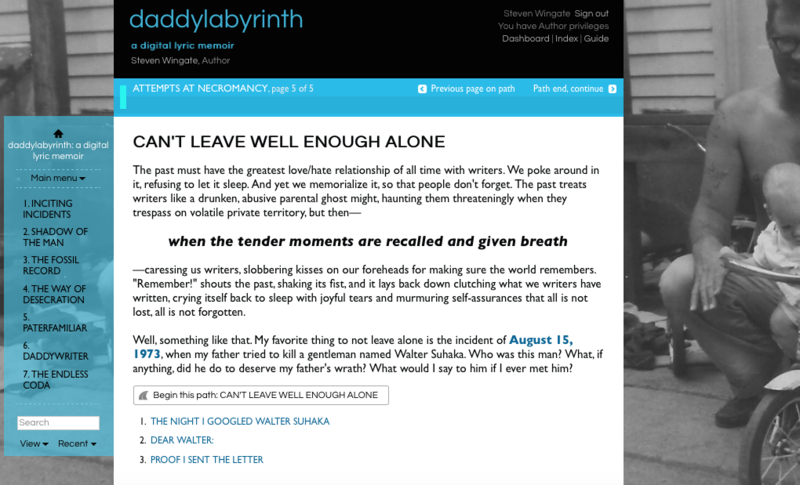 Thus was born a love-child of the lyric essay and hypertext called daddylabyrinth: a digital lyric memoir. Digital for its tools, lyric for its approach to its emotional material, memoir for its attempt to come to terms with a life—or in this case, several interconnected ones. The project became a vessel for my disparate but related texts and narrative lines, gathering all those partial, irresolvable half-stories I had written and allowing them to remain unresolved while still forming part of an identifiable, bounded work. Scalar helped me solve the problem of where each of those irresolutions might live by giving them, in rhizomatic fashion, multiple connection points to each other without the need for a single, dominant narrative line. Although its primary unit of structure is the path—a monolinear sequence of web pages—paths within Scalar can be nested inside of each other and interlocked, with a single page potentially belonging to several paths. In addition to backward and forward navigation within each path, Scalar offers a number of different ways to connect nodes across them: annotations, tags to classify nodes thematically, hyperlinks to pages inside and outside of the text, etc. The result of all this networking is a thick, quasi-rhizomatic mass of story data. With 350 pages and counting (many of them including video selfies) daddylabyrinth enables multiple opportunities for readers to create meaning through the combination and collision of its nodes. My principal conceptual metaphor for the work is a metropolitan transportation system, such as New York’s or London’s. The main paths (displayed as chapters on the Scalar menu) correspond to subway lines, none of which serve all stations but many of which serve more than one. These trains may let readers off at stations to ride a bus line (a subsidiary path) that may connect to other subway stations elsewhere on its journay. Story data that might be hundreds of pages “apart” if the nodes were laid out in monolinear fashion can be appear “next to” each other because of the way the work is structured using interlocking paths. The following sequence of pages spans multiple “chapters” in the space of four links. 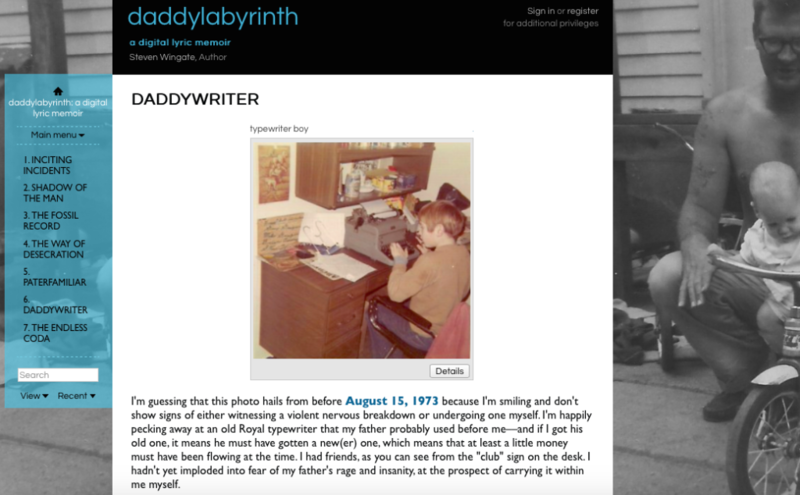 This sequence begins with an ekphrastic meditation on a photograph of my (much) younger self that resides on the opening page of the chapter called “Daddywriter.” It contains a hyperlink to the date of my father’s assault with intent to kill. “August 15, 1973,” which is a path in its own right, resides along the main line of a chapter called “Inciting Incidents,” and contains a hyperlink to the name of the man whose life my father sought to end. The “Walter Suhaka” link takes the reader to the first page in a small path (“Can’t Leave Well Enough Alone”) that is embedded within another path (“Attempts at Necromancy”) that is itself embedded within a chapter (“Shadow of the Man”). From this node, navigational readers have many options. They can begin the path (in which case they would read a letter I wrote to the man my father tried to kill, along with proof I sent it); they could step out a level to view the rest of the “Attempts at Necromancy” path; or they could merely click the “Path end, continue” link and arrive at the following page, which directs them to choose their next destination from a general menu of nodes and make a navigational choice based on the paths between them. Digital works that offer such options require a new kind of encounter with the text, both for readers and writers. Opening a monolinear book with a traditional Aristotelian structure and reading from A to Z differs considerably from reading a lyric essay, in which (though it is still nominally monolinear) the order of A through Z may be scrambled, truncated, or elided to the point where an Aristotelian structure is unrecognizable. The connections between individual notes and impressions—the accretion by fragments that Tall and D’Agata attribute to the lyric essay—are made primarily by the reader, who must add up pieces that may hover at the edge of coherence into an aesthetic experience that feels whole. The interactive digital lyric takes this active reading a significant step further. When we add in polylinearity and interactivity, reading activity becomes what I call navigational readership. If a work can only be encountered through the reader’s choices, then those choices themselves become part of each iteration of the text in ways that monolinear writing does not allow. Certainly we have a long history of seeing the reader as an indispensable part of the literary act; John Dewey (Art as Experience, 1932), Roland Barthes (The Pleasure of the Text, 1973), and Wolfgang Iser (The Act of Reading, 1980) have all written on the reader’s co-creative role in the realization of the work. With static text, this is primarily a matter of empathetically entering into the emotional world of the work in order to make personal sense of its components. One does not, except in the case of a few specially designed print books like Marc Saporta’s Composition No. 1 (1963), reach the end of a page and choose which one to read next. But with an interactive digital work, navigational choice is not only an expectation but a prerequisite; it is the only vehicle by which one proceeds through the text. Readers make active decisions about where to proceed that are based partially on the way the author has laid out the tale, partially on their own curiosity and interest. Without the function of those two actors, we do not have an interactive text. 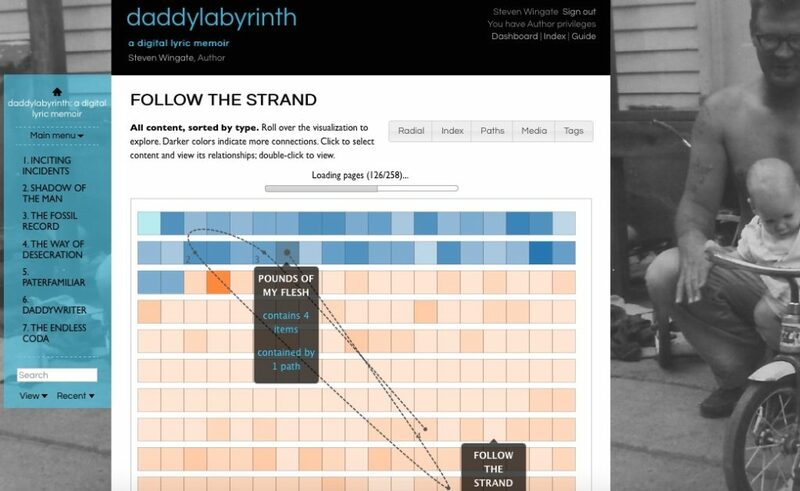 The idea of navigational readership is embedded within the interactive digital lyric, as it is within the authoring tools that enable such works. daddylabyrinth’s multiple paths, nested within another and interwoven, do not merely allow readers flexibility in determining where to proceed next in the story; they force readers to make individual choices that are necessary to shape the story. Simply “turning the page” by using Scalar’s “next page on path” functionality will intentionally frustrate readers of daddylabyrinth, as I purposely make such readings difficult by ensuring that simply clicking “next” does not result in a straight line through the work. That click may jump readers from one chapter to an entirely different one, or bring them back to the home screen, or take them to a place where they must choose their next node based simply on the title of a page—as in the final screen capture in the series above. Two people reading a print book may have different experiences of that book; but if they have both read from beginning to end, they have experienced the same text. In a digital environment, they may actually be experiencing entirely different books. Although one can theoretically read daddylabyrinth sequentially (starting from my father’s ancestry and ending with the growth of my own sons), none of the readers I have spoken with read the work in anything resembling this fashion. They all did exactly what I had hoped they would do, which is to get lost in the book and poke through its story data just as they would surf the web: clicking on a node they felt drawn to, reading it, and moving on to the next page that catches their interest. This arrangement involves some “surface scan” reading, which proponents of close reading may decry. But skimming the surface and reading closely are only two of our many possible relationships to text, and interactive digital works require both. It is in the surface scan that navigational decisions are made, so we must not decry skimming too much because it enables and facilitates close reading and the development of theme. Among readers of daddylabyrinth, this level of reading played a significant role in the generation of meaning, as surface scans determine not only which paths to follow but where one might “jump” between paths to pursue a given topic. One reader had recently become a father himself and felt drawn to the pages where I discussed my own parental experiences, though these were scattered across several different chapters. Another, with an alcoholic father, felt herself drawn to daddylabyrinth’s pages on substance abuse and its consequences, which are somewhat concentrated but still span across the work. Another spent much of his time reading about my father’s legal troubles and his short stories (he was an aspiring fiction writer), as well as the stories that I wrote about fictional fathers. All three of the readers above encountered a work called daddylabyrinth, but each had profoundly different literary experiences not only on the level of meaning creation but on the textual level. This is because the interactive digital lyric is not simply a story to read from beginning to end but a place to visit and revisit, in which one can experience multiple stories via multiple possible navigations. To borrow a term from gaming, the interactive digital lyric—especially in its long form—is a work one can play and re-play. New forms of reading require new forms of writing, and to discuss this I would like to hover for a moment around the idea of place. Michel de Certeau writes that “[e]very story is a travel story—a spatial practice” (1988, 115). He suggests that stories “traverse and organize spaces” and that “narrative activity, even if it is multiform and no longer unitary, thus continues to develop where frontiers and relations with space are concerned. Fragmented and disseminated, it is continually concerned with marking out boundaries.” (1988, 125) Though Certeau wrote this nearly a decade before the internet took off, he is quite prescient about the practice of digital writing today. In a networked situation in which vast amounts of story data are adjacent to one another in conceptual space—the entire works of Shakespeare just two clicks away from millions of contemporary life stories on blogs—how do we then shape our stories within this massive space? We do it by establishing boundaries to constrain potential narrative space, as Certeau suggests, and by presenting the reader with navigational tools to make choices within this space that create meaning. A vast set of story data without shape becomes an unnavigable chaos—a danger that must be faced by the lyric essay and interactive digital narrative alike. If we conceive of a story not as a thing to be read but as a bounded space to be visited—what I call a narrative environment, following Mark Amerika’s description of his landmark hypertext work Grammatron (1997)—then the process of traversal is built into the story experience. The hopping between fragments through virtual space that one does in a digital project like daddylabyrinth is analogous to the kind of hopping one does within the fragments of a lyric essay. What differentiates them is that in the interactive lyric essay, the order of its component story nodes is established by the author. In the digital lyric, its potential orders are determined in part by the author and its actual orders by the readers who navigate the narrative environment. The role of the author in the interactive digital lyric is no longer to simply put the words in order in a way that best allows readers to create meaning, but to present a set of possible navigations that each allow readers to make meaningful choices which will result in a multiplicity of unique literary experiences. I call this practice “synaptic writing,” because its allows for a traversal of narrative space that resembles the synapses of the human brain—an interlinked network of lines between nodes of narrative, each reaching out toward others and connecting story data through congruence and collision. Synaptic writing involves arranging the component building blocks of narrative to best enable the associative process by which readers create meaning—an attempt to make the leaping functionality of story mimic the leaping functionality of the human mind. It is the same basic approach that practitioners of the lyric essay take, but with the added dimension of enabling reader navigational choice. For daddylabyrinth, writing synaptically meant composing primarily within Scalar, as opposed to writing on a traditional word processing system and importing text into the authoring tool. This enabled me to instantly make hyperlink connections between pages, establish or revise paths, etc.—which in turn enabled me to explore, bring together, and juxtapose my own mental and emotional associations in a way that word processors would simply not allow. The nature of the authoring tool fueled more connections between nodes than I would otherwise have discovered, and they often fired out in associative chains that led me to connect story nodes that would, in any monolinear paradigm, have been very far apart from each other. As author, I created paths and links that followed my emotional associations; I count on readers to navigate the work based on their emotional associations. This strikes me as the essence of the interactive digital lyric: using the affordances of the computer and the network to not only traverse the conceptual story space of our personal narrative environments, but replicate them for the reader to traverse as well. My goal in this essay has been to establish a conceptual space for the interactive digital lyric that shows its indebtedness to the lyric essay in theory and in practice. Secondarily, I hope to have demonstrated the lyric essay’s deep connection to digital forms and convinced readers that its footprint will grow larger as it recognizes the ways in which its aesthetic is mirrored and expanded by digital interactivity. The lyric essay has a strong opportunity to relocate at least some of its energy into digital forms. Ned Stuckey-French has written eloquently about the video essay in American Book Review (2012), discussing among others the decidedly lyric Zidane (2010) by Claudia Rankine and John Lewis. Interactive documentary—a burgeoning field championed by MIT’s Open Documentary Lab is journalistic by nature, but nonetheless open to the kinds of fragmentation and associative thinking that give the lyric essay its identity. (One can imagine a day when a branch of interactive documentary veers toward the lyric, just as a branch of the print essay did.) The canon of electronic literature itself contains a number of works we could consider interactive digital lyrics, including David Jhave Johnston’s Sooth (2005) and Stephanie Strickland, Cynthia Lawson Jaramillo, and Paul Ryan’s slippingglimpse (2007). Such works combine interactivity with the linguistic sensibility of the lyric essay, creating introspective personal emotional spaces—and there are vastly more points of contact in the electronic literature realm than these two. By exploring its intersections with contemporary digital practice, the lyric essay community has an opportunity to expand its critical and creative reach beyond the printed word. Those who do so will find that they are simpatico with a legion of digital practitioners who are already—though sometimes using different languages and dialects—in the same lyric conversation. Amerika M (1997) Grammatron. Available at: http://www.grammatron.com/about.html. Borges JL (1962) Labyrinths. Trans. Yates DA. New York: New Directions. de Certeau M (1988) The Practice of Everyday Life. Berkeley: University of California Press. Deleuze G and Guattari F (1987) A Thousand Plateaus: Capitalism and Schizophrenia. Trans. Massumi B. Minneapolis: University of Minnesota Press. Jackson S (1995) Patchwork Girl. Cambridge, MA: Eastgate Systems. Joyce M (1987) Afternoon. Cambridge, MA: Eastgate Systems. Lopate, P (2005) “Reflection and Retrospection: A Pedagogic Mystery Story.” The Fourth Genre, Spring 2005. Malloy J (1986) Uncle Roger. San Francisco: Art Com Electronic Network. Manovich L (2003) New media from Borges to HTML. In: Wardrip-Fruin N and Montfort N (eds) The New Media Reader, Volume 1. Cambridge, MA: The MIT Press, pp. 14-26. Moulthrop S (1992) Victory Garden. Cambridge, MA: Eastgate Systems. Murray JH (1997) Hamlet on the Holodeck: The Future of Narrative in Cyberspace. Cambridge, MA: The MIT Press. Numinous Games (2016) That Dragon, Cancer. Rankine C and J Lewis (2010) Zidane. Ryan ML (2006) Avatars of Story. Minneapolis: University of Minnesota Press. Saporta M. Composition No. 1 (1961, Paris: Éditions du Seuil) by Richard Howard. New York: Simon and Schuster, 1963. Stuckey-French N (2012) “The Video Essay.” In American Book Review, Volume 33, Number 2, January/February 2012, pp. 14-15. Tall D and J D’Agata (1997). “The Lyric Essay.” Seneca Review, Fall 1997. Steven Wingate is a multi-genre author whose work ranges from print to interactive media. His short story collection Wifeshopping won the Bakeless Prize for Fiction from the Bread Loaf Writers’ Conference and was published by Houghton Mifflin Harcourt in 2008. His prose poem collection Thirty One Octets: Incantations and Meditations was published by WordTech/CW Books in 2014. His digital lyric memoir daddylabyrinth premiered in 2014 at the ArtScience Museum of Singapore and his interactive video Talk with Your Hands Like an Ellis Island Mutt will premiere in 2016 at the International Symposium on Electronic Art in Hong Kong. He teaches creative writing, film, and digital media at South Dakota State University.